The time has perhaps come to inscribe finis under the story of the current dispensation as far as the depletion of moral capital is concerned, even if the winding up protocols must wait until Prime Minister Narendra Modi’s opponents can show greater tactical awareness and the spirit of self-abnegation. The Modi regime has lost steam because it has deviated widely from its promises. It was elected with much expectation to deepen democracy. That is what the promise of “achhe din” encapsulated in essence – the betterment of the lives of the poorest people. But in a fairly short space of time, the shape of governance began to undergo changes that bewildered its backers. Now more and more people are beginning to worry about the overt display of authoritarian tendencies. This prime minister’s mocking exercise of power has begun to cause resentment in BJP circles as well, and arrogance is being spoken of. Still, Modi – lest this be overlooked – remains mindful of how he is perceived. He has not held a single press conference in four-and-a-half years, a perverse record for a democracy. Even the outrage-causing president of the US allows himself to be questioned by a hostile media every other day. However, the PM has a one-way communication running through his “Mann Ki Baat” talks over government radio and television. He thinks – mistakenly in light of murmurs of discontent that can now be heard all round – that this lets him connect with his core followers direct, and that he retains his earlier popularity, affording him the room to be masterful and dismissive of senior colleagues in party and government, not just the opposition. Of course, Modi has become increasingly conscious of late of the sheer necessity of having to show he still has a big lead over the opposition in numbers terms in parliament. Since his own party has fallen below the majority mark in the Lok Sabha after a string of recent by-election defeats in different states, the PM would be loathe to lose any more allies (after the TDP walked out of NDA and the Shiv Sena refused to vote with the government in the no-trust vote last month). There is an anxiety that if more allies renege, BJP MPs themselves may become emboldened to turn disloyal. No government can countenance an atmosphere of such anxiety among its MPs months before the next parliament election. The sense has sharpened in the BJP camp after the recent no-confidence motion debate that the ship is going down, though the NDA won. BJP’s Dalit MPs appear especially vulnerable as the anti-Hindutva churning among Dalits outside of the BJP has emerged as a factor of note throughout the country. The prime minister cannot afford to appear unmindful of these developments, and therefore must continue with his earlier flamboyance in attacking opponents in order to retain the affection of his allies and core constituencies. But within the BJP itself, no one now misses the obvious – that after winning a massive mandate, Modi has come to operate an oligarchy – a government by the few. All too often this boils down to a government for a few. This means institutions do not matter and are likely to be disregarded when the need arises – in order to benefit the powerful ones or punish opponents. We saw this with the Election Commission around the time of the Gujarat assembly poll last year, and with the Supreme Court, obliging four senior judges to hold a press conference to air institutional and moral concerns. We also see this in the clumsy political misuse by the government of the army on the issue of the so-called surgical strike which had no deterrent value. Also, newspapers are replete with stories of the CBI, Enforcement Directorate or the Income Tax machinery threatening political opponents. In practical terms, in India, a government for a few is a plutocracy, a government of the wealthy, and a government that overlooks the interests of the poor, whatever the propaganda. The data now points in this direction. A handful of friends of those in authority benefit from policy, but this is sought to be covered up with demagoguery, populism, ultra-nationalist slogans – on the whole, we appear to have stumbled on a regime characterised by a pursuit of selectively corporatist ideals with a few crumbs for those at the lower end. The poor are invoked out of cleverness, not with serious intent. In Argentina, there was Eva Peron who spoke of “the shirtless” – the descamisados – as she pursued corporatist ends; in India there is Modi. He capitalises on the unattested story of his tea-selling origins and flies to New Delhi to take oath of office in 2014 in a private plane of an industrialist with widespread interests. “Sab ka saath, sab ka vikas” as a slogan was evidently only a clever distraction, though initially it wasn’t seen in that light. Not sending Rs 15 lakh to the bank account of every Indian has turned out to be not the only “chunavi jumla” that BJP president Amit Shah alerted us to. The story of deepening joblessness and expanding poverty is too well-known to be re-told. On the other hand, some perhaps can’t believe their luck. In September 2016, the sudden change of the Indian partner for the Rs 59,000 crore Rafale fighter aircraft deal with France, to which Rahul Gandhi recently drew pointed attention in the Lok Sabha, tells its own story of ignominy. It may be instructive to have the issue debated threadbare in Parliament followed by the appointment of a joint parliamentary committee to examine the contract. While corporate friendships now appear to go a long way, the fate of businesses as a whole does not look all that bright in the Modi raj. All other sections – the various rural classes and the urban underclass – have naturally been left to fend for themselves. Oligarchy has taken hold in the political sphere as well. Now it is Messrs Modi and Shah all the way – a neat letterhead of political interests, which has an uncluttered past from the rough and ready Gujarat days. There was a third partner once, but he has quite literally retired hurt. It is doubtful the principals take too keen an interest in his whereabouts now, for he wasn’t exactly like them. The original duo realise elections are near, and the mood in the party is glum. The deities of the Rashtriya Swayamsevak Sangh (RSS) must therefore be appeased with vigour so that the ‘Hindu’ battalions may be galvanised when it matters. But here too there seems a problem – an unusual one. The warriors may have gone soft. They have been spoilt with power, with which comes attention and resources follow. How well does an overfed army fight? That’s the question. But the deities must continue to be propitiated. That’s one reason why the mob violence that we see – the lynch mobs that mostly kill Muslims, the poor, or women in distress – cannot be stopped for now, no matter what the Supreme Court may say. Reverence will have to be shown to cow vigilantes and those who kill and intimidate intellectual and political dissenters. They are very much a part of the political oligarchy, which is permitted to stop at nothing. If the mob attacks began near Delhi, the heart of the sultanate, with a poor Muslim villager named Akhlaq, among the most violent recent mob attacks has been the waylaying of Swami Agnivesh, an 80-year old saffron-robed Hindu monk and social activist who has not been afraid to speak up. 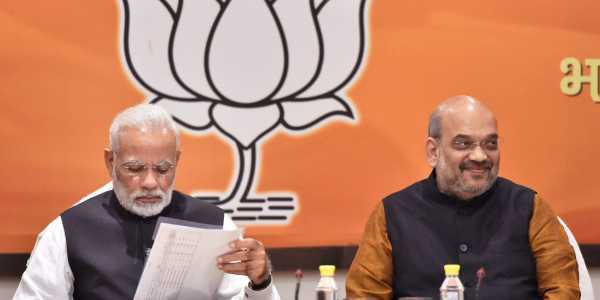 The oligarchy form of political management has had a particular kind of effect in the BJP, the foremost of which is that people keep their woes to themselves and those outside the charmed circle nurse their grievance in silence. Sushma Swaraj, Nitin Gadkari, LK Advani sat through the recent no-trust debate impassively. Rahul Gandhi making pointed references in the Lok Sabha to not just the Rafale contract, but also the sudden good fortune of Shah’s son, which was practically blanked out in the media, may have liberated these saffron leading lights from their fears. The only senior to hold forth was Rajnath Singh, who appears to enjoy basking in reflected glory. Speaking of Rajput warriors whose lives hold a lesson, he seems to prefer the Jaichand model of acquiescence to that of Prithviraj Chauhan, who took up the challenge when he faced one.